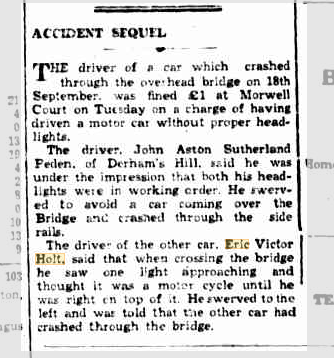 To find articles about the family, I first started my search using the initials of Elsie’s husband, Sydney George Holt. The first article found was for the wedding of their son Allan Raymond Holt. What caught my eye was the name of the minister – he officiated at my wedding, 30 odd years later. There were several other results for S. G. Holt, so I narrowed my search to the Morwell Advertiser, and found the engagement notice for Allan, and a Local Land Board article that mentioned S. G. Holt. 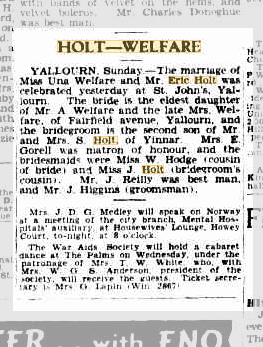 I then decided to search for any articles in the Morwell Advertiser for the surname Holt. There were 49 pages of results for the surname Holt in the Morwell Advertiser, so I then narrowed my search to each given name in turn, starting with the name Sydney. There were a couple of articles about a Sydney Holt being fined for not eradicating ragwort in 1922 and 1935. I am not certain at this stage if these articles relate to Sydney George Holt. There was nothing for Elsie, or for eldest son Reginald, which just left Eric. I then expanded my search to all Victorian newspapers, and located the marriage notice for Eric. It appears that the eldest son Reginald never married – the electoral rolls up to 1954 show he was still living with his parents at 33 Elgin St Morwell. He died in 1960. I haven’t been able to find a marriage notice for Sydney Colin Holt.